Dr. Shiju graduated with a BDS degree from MGR university and subsequently completed his MDS Orthodontics master’s degree from Rajiv Gandhi University. In his impressive eighteen years in the industry, he has successfully completed over 3000 braces treatment cases. 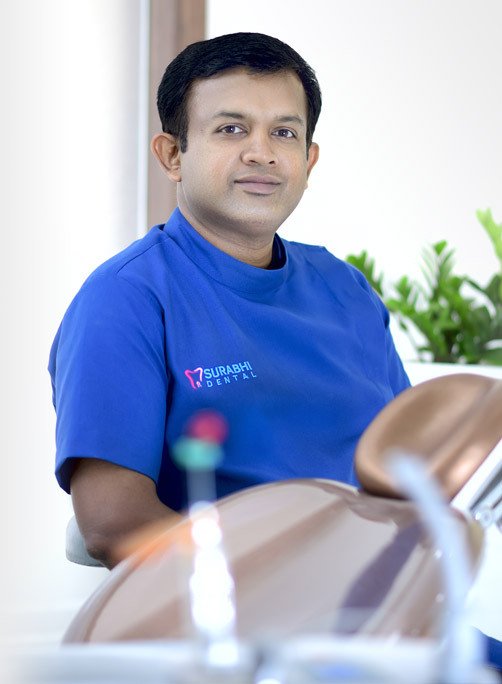 For the past many years, he has been practicing cutting edge dentistry at his proprietary enterprise Surabhi Dental. Prior to that he has worked as a much sought after consultant orthodontist at various hospitals including the Lakeshore Hospital in Kochi. He has also enjoyed a successful stint in academics, having been called to share his expertise as a Senior Lecturer at Indira Gandhi Institute of Dental Science, Kothamangalam and as a Professor at Educare Dental Institute, Kottackal. As an Orthodontic specialist, Dr. Shiju has demonstrated his expertise in a wide variety of highly skilled dental treatments including Straight wire Braces technique, Self ligating braces, Ceramic Braces, Clear Aligner, Myofunctional Appliances, Orthopedics Appliances and Orthodontic mini implants. He is skilled in other aspects of dentistry as well, having completed numerous procedures including, but not limited to, Laser assisted Root canal treatment, Post and core, crown and bridge, Biolase Laser soft tissue management, Laser teeth whitening, smile designing and composite restorations. His passion for orthodontics translates to a personal need to be up to date with the latest in his profession. He regularly attends courses in new technologies and techniques, participating in educational events such as those on oral implantology organized by the ICOI International Congress of Oral implantologist held at Cochin Implant Institute and the continuing dental education programs on Cosmetic Dentistry conducted by the Indian Dental Association. Dr Shiju enjoys spending his free time with his family and friends and loves to play Badminton. He is also an active member of Rotary International, having previously served the Angamaly Heritage Rotary through separate tenures as its President and as its Secratary. Surabhi Dental offers treatments like straightening teeth with Braces,Replacing missing teeth with implants, bridges and dentures, veneers and crown,Teeth whitening etc.